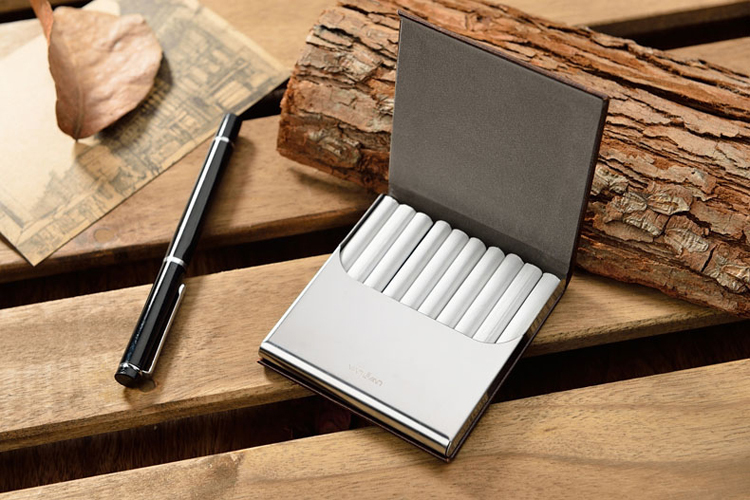 Cigarettes became quite popular so there are a lot of options on the market to make them easier to be carried or just to give them a more elegant feel. Nowadays, they come with a lot of accessories: from classy cases and cigar humidors to hipstery cigar ashtrays — there are a variety of options out there. In order to help you choose one suitable for your style, we created the section below. A very classy cigarette case, with an assorted design, it will hold 20 regular-sized or 100 smaller-sized cigarettes. The item is 100mm long and the overall measurements are 3 1/4-Inch wide x 4-1/8-Inch tall x 11/16-Inch thick. Customers say they are happy about the engraving on both sides of the case and on the inside as well. To open the case there is a button on the side that you have to press and it opens with a spring hinge. It snaps shut so you don’t have to worry about your cigarettes falling out. Also, some users have bought this to keep their money and it worked well. This practical case has a huge bonus — it’s a package of four cigarette cases! Moreover, they come in different colors: blue, green and red (you`ll get two of the same color). They are designed for 100mm tubes. Customers say that the cases are easy to open and are comfortable for everyday use. Also, they consider it a good buy since they keep tobacco from spilling all over the bottom of your purse. If you tend to smoke half and save half for later, these are great at containing the odor of the burnt half. This is a more hipster-like cigarette case. It can store 4 – 5 pieces king size cigarettes and has a layered interior design. This cigarette case is lightweight and it is made of high-quality aluminum alloy, which makes it strong and durable. Customers say it holds the smell well, it attaches nicely to their key rings or so and it opens and closes smoothly. Also, some bought it for pills or other small objects so it has multiple uses. With an elegant and practical design, it’s a perfect choice if you want to take a few smokes with you while running or going on a short walk. Nice and elegant, this product has an impressive design. Its color is a charcoal black and it has a stainless steel cover. Also, boasting an ultra-thin design, the thickness is only half of an inch. Easy to use, it requires a one-hand operation and a big bonus is that it is curved in such a way that it fits nicely in most clothes’ pockets. Moreover, you can control the cigarettes you smoke each day since the product can keep up to ten. Customers recommend it because it’s lightweight and contours to the shape of the leg so it sits comfortably in their pocket. This one is a very functional case. The product can easily hold a box of 100’s and it also has a pocket for the lighter. The leather gives it a very elegant look. Customers are pleased with the quality of the leather and its softness. They are happy with the price as well and some said that the biggest advantage is that it keeps the cigarettes and the lighter in one place, so they no longer have to search for the lighter in a big, filled purse. All in all, it is an affordable, elegant and functional product. Stylish and lovely are the best words to describe this case! This is a wooden box made out of natural wood with brass elephant inlay and besides its cute design, it serves multiple purposes. The box is handcrafted from pure wood in India. The golden elephant on top of it is a nice touch and it gives the box more elegance. Customers are happy with the quality of it and they say it is pretty large so it can hold even king-sized cigarettes. Most of them say it rather fits in an office, but a few people use it to sort their grooming tools or jewelry. This cigarette case is the definition of the word classy! It is made from pure copper and it fits twelve regular sized cigarettes (not 100`s). The measurements are 85mm x 54mm x 20mm. Customers are really happy with this solid little case and its design (which they appreciate the most) and some of them have used it for other purposes as well. They are pleased with the size since it holds enough cigarettes and it doesn’t take a lot of place. This is a good choice for a gift or if you spend your time in more formal environments. Another elegant and stylish option, this case can hold up to twenty regular sized cigarettes or 100`s sized cigarettes. An advantage would be that it fits in the customer’s pocket just fine and if you want to keep other things apart from cigarettes in it (like money), the case is not visible in your pocket. Customers say that the construction of the case is well done and they do not expect it to break any time soon after the purchase. Also, they say the arabesque design is lovely and the smooth, rounded edges give it a pleasant aspect. This case can hold a full pack of hard or softbox king size cigarette or a full pack of king-size or 100’s loose in the pack. It has a front pocket for a lighter or matches and it comes in four colors: dark brown, brown, black and blue. It also attaches to the belt and this makes it more convenient for those who do not work in an office. Customers are happy with the size of the case since it can fit a pack of cigarettes and also with the size of the lighter holder. This is a case suitable for anyone! It is practical, simple and easy to use. Furthermore, it comes in fifteen different colors and has a pocket for lighter storage. The material of this product gets softer, shinier and supple with use. Every case is handmade. Customers say they are built to last. They are pleased with the variety and the quality of the colors and they enjoy the soft skin of the case. The construction is well made, it easily fits 100`s and the way it opens and lifts your cigarettes up makes it easier to take them. A cigarette case is an ideal way to carry your cigarettes while making sure they don’t get crushed by accident. This sort of item also looks sophisticated and high class, and there are plenty of smokers who opt for this practical and cool solution for their cigarettes. However, if you are interested in finding a cigarette case for you or offering it as a gift, you will notice that there are many models available on the market. That can pose quite a challenge, since choosing the right cigarette case will feel like a task with not so smooth solutions. Among the many cigarette cases for sale, you will see many praised and loved by their buyers, while others may be hidden gems. As long as you learn how to look at them, and what exactly you must notice most and foremost, you will make a wise choice. We hope that the following buying guide will be of assistance. We did all the homework and discovered what features you should look for in a cigarette case, and on what you should base your decision when you want to reach for your wallet. While the outward appearance of such an item matters, we also took other things into account, as you will see right away. In our quest for the best cigarette cases, we evaluated customer reviews, opinions from experts, and we took a close look at all the features available. That helped us put together a clear picture of how the perfect cigarette case should look like, while taking into consideration the person who is going to use it, as well. Usually, cigarette cases are designed to accommodate 20 cigarettes, so, if you want to transfer them from a regular pack to the case, that will be easy to do. However, a cigarette case presents some advantages since you will be able to keep them dry and in perfect shape, unlike a regular pack that cannot protect them. You will notice that manufacturers offer clear details about the measurements of the cigarette cases they sell. That will tell you a few essential things, like whether the cigarette case is suitable for holding regular cigarettes or extra long ones. Also, you may be interested how thick the case is so that you can fit it comfortably in your pocket. Usually, cigarette cases are made of metal, so they are very durable. However, you may want to pay a little attention to how durable the case is. 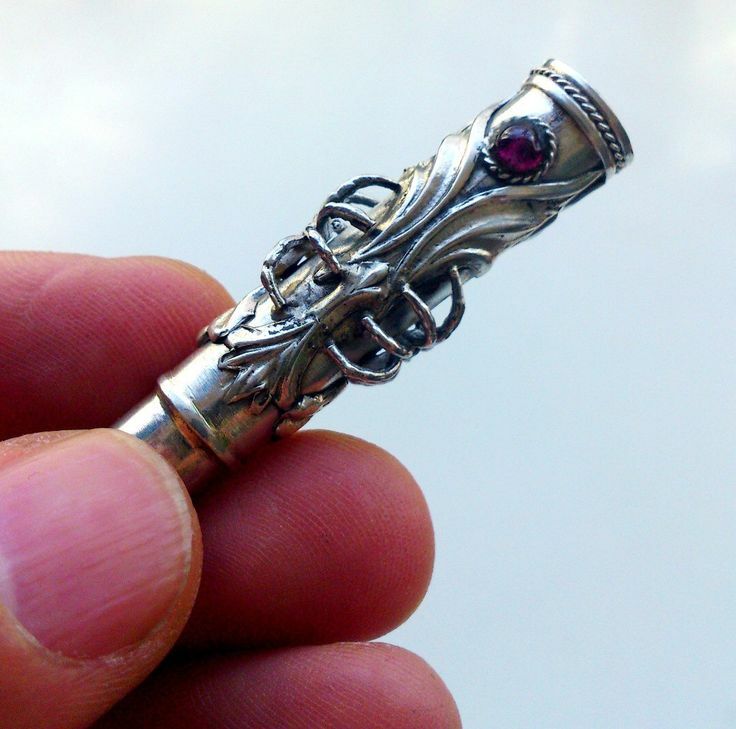 The more expensive models are made from sterling silver, and they are gorgeous and sophisticated. Insertions made from other precious metals may also be present in the design. There is nothing wrong with getting a case dressed in leather, either. If you are all for a more minimalistic design and you don’t want to stand out each time you take out your cigarette case, that may be a good solution for you. Leather models are also very durable, and you don’t have to worry about dents caused by accident. However, if you want a model that works with your Zippo lighters, you might want to stick to a metal case. A cigarette case, as mentioned, must be practical, not only cool looking. That means that you need to pay attention to other details, as well. For instance, models with a spring-loaded mechanism for closing the lid each time, are a more practical solution, because you don’t have to worry about the top remaining open by accident. The cigarettes will all be kept inside in perfect shape, and your clothes will not get ruined by unfortunate events. Check the cigarette cases reviews available from users, if the manufacturer does not mention this aspect, to see if there is such a locking mechanism available. The flat design is not the only one available right now. You may be used to the classic rectangular flat appearance, but now manufacturers are taking quite a leap of faith and offer their customers cigarette holders that come as cylinders and other similar shapes. For hip smokers who want something else, away from the classic look, that can be an excellent option. Just bear in mind that you don’t have to stick to the flat design if that is not your thing. Is it for a man or a woman? Who are you buying the cigarette case for? A man or a woman? This is an important question since cigarette cases tend to be more ornate when they are designed for female users, while the ones for guys tend to be more minimalistic and austere. When you want to offer gifts, whether it is such an accessory or an excellent cigar ashtray, you will always have to consider what your friend would like. Even your lady friends might want a cigarette case with a straightforward design, so you may have to skip the ornate models if that is how the situation presents itself. The great thing about cigarette cases is that they are available in so many designs, materials, and options. However, at the same time, that may be a bad thing, because, given so many choices, you might find yourself overwhelmed. Here is some additional information that might help you in this regard. There are many beautiful vintage cigarette cases available on the market. They might be a bit expensive, but, you can still strike some excellent deals. Still, if you like a vintage design, you may find new cases that are just designed to resemble those vintage looks. If you are looking for something unique, you may want to opt for a handmade model. Some artists offer such services, but, again, expect to pay a premium price, if you wish your cigarette case to be unique.